This recipe for Baltimore pit beef has been a long time coming. 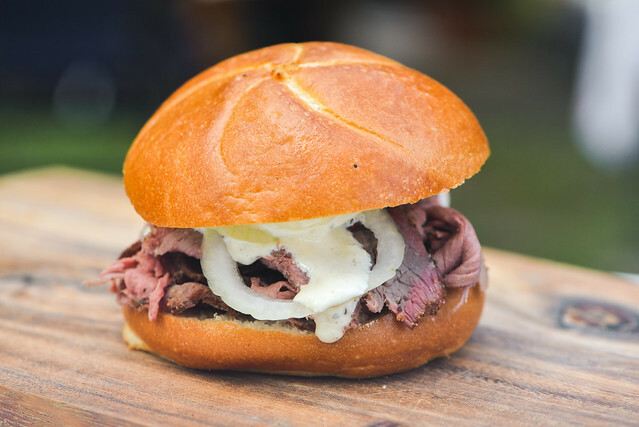 It was on my radar as something I really want to develop a recipe for from my early days of cooking because it was somewhat familiar to me from past trips to Baltimore and also incorporated both my love for grilling and roast beef. I always kept it on the back burner though because I felt like I really needed a meat slicer to get the ideal thin and even cuts to get it right—I knew my lacking hand slicing skills would not be good enough. While in New York though, a meat slicer was not a practical purchase because the space it would require was never available in our apartment, then when I moved to North Carolina, I felt like I needed to be settled first before adding another bulky item to my kitchen. Well, it took over twelve years for the time to be right to add a meat slicer to my arsenal of tools, but it finally happen last winter when my mom gifted me a Chef's Choice model, and while some adverse weather put delays on earlier attempts to make Baltimore pit beef this year, it finally happen a couple weeks ago and the results were glorious. One of our favorite hang out spots in Durham is Namu, a Korean joint with great indoor and outdoor spaces to eat and drink with friends, which I recommend checking out if you're ever in town. Korean barbecue serves as the backbone of their menu, and there doesn't seems to be much they don't turn it into. Their menu covers everything from the traditional, like bibimbap and mandu, to the creative, like tacos, quesadillas, and loaded fries. This got me thinking, if Korean barbecue is so versatile, what else can it do well? 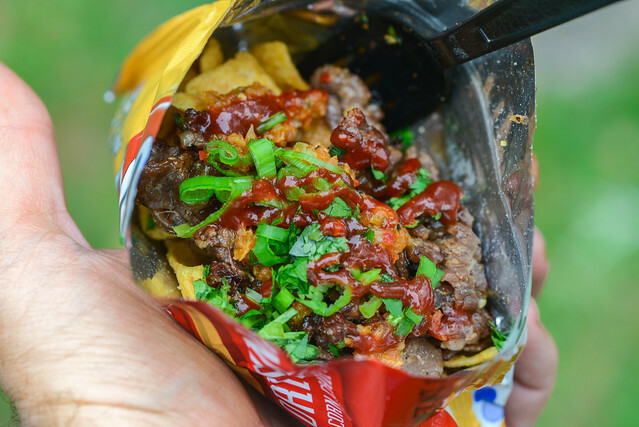 It wasn't a great leap to get from tacos to walking tacos, but I realized I had never seen Korean barbecue topped Fritos ever before and it suddenly became my mission to make it. I made both spicy pork bulgogi, which I've already reported out on, and this beef bulgogi as toppings, and I'm happy to say both worked great in the walking taco format. Skirt, flank, and hanger are my personal trifecta of favorite steaks. While I eat skirt and flank fairly regularly due to their easy procurement, hanger tends to be a special occasion type of thing. It's actually been a couple years since I last cooked a hanger, leaving me with an ever increasing desire to grill one up and decided that using Momofuku's hanger steak ssam recipe at my Korean-themed Meatwave would be the perfect occasion to get some of this delicious, beefy steak back into my life. That proved easier said than done as no local shop had any hangers in stock, and I was too late to place a special order. 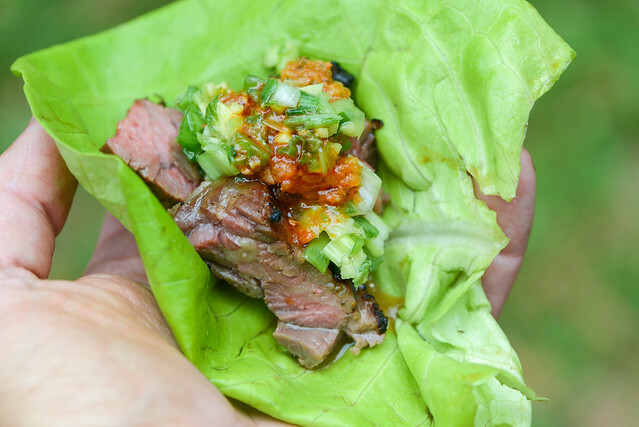 So a bit disappointed, but not defeated, I kept chugging along with the idea, but just swapped the fairly similar skirt steak in place, and really, at the end of the day, when the beef was made into lettuce wraps with a variety of toppings, the difference between skirt and hanger probably would have been pretty indistinguishable. It's kind of odd that barbecue is a summertime cuisine—is large amounts of hefty, fatty meat really what you're craving when it's scorching hot and humid outside? I think we only really say "yes" because of the years of tradition behind smoked and grilled meats, but I wondered, in a more pragmatic reality, if I wanted something grilled on an oppressively hot day, what would that be? 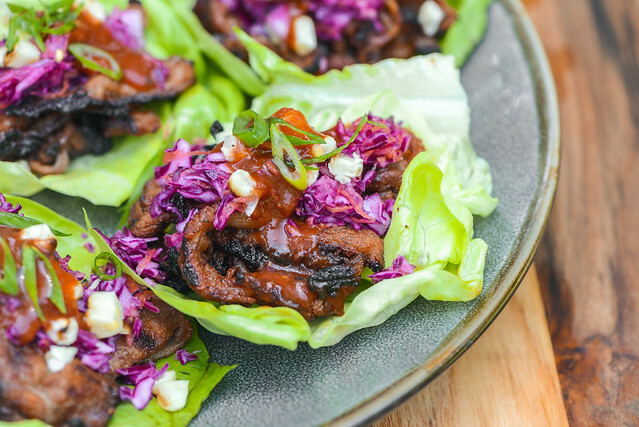 At least one answer to that question ended up being these barbecue beef lettuce wraps, which deliver a ton of familiar summertime flavors in a more light and refreshing manner. I've done pastrami all sorts of ways at home—traditional, with short ribs, with duck, and even the Montreal equivalent—but for some reason, I've never made it into reubens at a Meatwave. 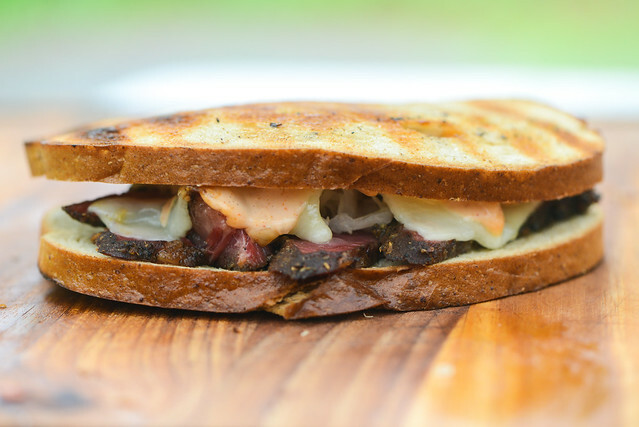 I know, I know, a traditional reuben is made with corned beef, but given the choice between pastrami or corned beef, are you really going to opt for the later, less tasty, cured meat? So when I decided I wanted to make some pastrami for my Memorial Day blowout this year, it was a no brainer to finally assemble it some ruebens to share with my guests and all of you!